Khao Laem Dam in Thailand is situated in the province of Kanchanaburi which is the third largest of Thailand’s provinces. Kanchanaburi province is situated in the western corner of the country bordering Myanmar (Burma) on its western perimeter at the ‘Three Pagodas Pass’. Khao Laem Dam in Thailand offers some of the best Giant Snakehead fishing in the country amongst stunning jungle scenery. Kanchanaburi province in Thailand is a place of immense natural beauty with various rivers, waterfalls and magnificent limestone peaks. Some two hundred and eighty kilometres North West of Bangkok (4 hours travel time) deep into Kanchanaburi province lies Khao Laem national park. The national park is a protected area by the Thai government, it is host to an abundance of flora and fauna and habitat to countless species of animals. Khao Laem national park is a highly mountainous region in parts with some of its limestone peaks reaching in the excess of one thousand eight hundred metres. These peaks are the original source for the River Kwai Noi (small) and other important rivers that begin their journey in the mountains before flowing down through the rich plains of Kanchanaburi. 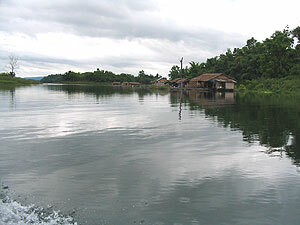 The introduction of a massive hydro-electric dam to the River Kwai Noi (small) caused a huge natural reservoir to form. With a length of over sixty kilometres at its longest section and over twenty five kilometres at its widest, this dam is a veritable ‘inland sea’. This scenic and atmospheric venue is a wonderful and idyllic location to fish and a truly magical destination. 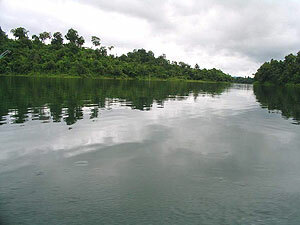 Surrounded by lush green jungle this vast body of water contains some of South East Asia’s most aggressive predatory fish laying in wait for their unsuspecting prey! Various native Snakehead species inhabit this gigantic reservoir, lurking in the tangled root systems and submerged trees that line its banks. In addition this dam also contains various other species including Hampala Barb (Jungle Perch) and Rohu (Indian Carp). 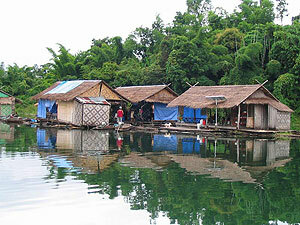 Traditional floating fishing lodges are located at various parts of the dam. These lodges serve as basic accomodation and as a base for your daily expeditions to different parts of the lake. Delicious Thai food can be purchased at some floating bungalows with even a floating supermarket onsite where visitors can purchase essentials. The dam is best visited after heavy rains when water floods down from the surrounding mountains carrying all manner of insects and food items down to the lake and the Giant Snakehead partake in their annual spawning season. During this spawing/hatching season Snakeehad will aggressively attack anything that approaches the offspring making lures much more appealing to this wild predatory fish. The majority of angling at this venue is boat based with anglers exploring the many islands,inlets and sunken forests with the use of traditional longtail boats captained by experienced local angling guides.